Definition at line 22 of file CQProgressDialog.h. Definition at line 31 of file CQProgressDialog.cpp. Definition at line 46 of file CQProgressDialog.cpp. 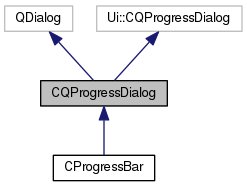 Definition at line 102 of file CQProgressDialog.cpp. Definition at line 111 of file CQProgressDialog.cpp. Definition at line 119 of file CQProgressDialog.cpp. Definition at line 127 of file CQProgressDialog.cpp. Definition at line 98 of file CQProgressDialog.cpp. Definition at line 76 of file CQProgressDialog.cpp. References CQIconResource::icon(), mItemCount, mPause, mProceed, CQIconResource::playerPause, CQIconResource::playerStart, CQIconResource::playerStop, and timerShow(). Definition at line 51 of file CQProgressDialog.cpp. Definition at line 106 of file CQProgressDialog.cpp. Definition at line 65 of file CQProgressDialog.cpp. Referenced by CProgressBar::finish(), and CProgressBar::slotFinishItem(). Definition at line 137 of file CQProgressDialog.cpp. Definition at line 49 of file CQProgressDialog.h. Referenced by init(), insertProgressItem(), and removeProgressItem(). Definition at line 35 of file CQProgressDialog.h. Referenced by btnContinuePressed(), btnPausePressed(), btnStopPressed(), init(), and CProgressBar::progressItem(). Definition at line 34 of file CQProgressDialog.h. Referenced by btnStopPressed(), CProgressBar::finish(), CProgressBar::finishItem(), init(), CProgressBar::proceed(), CProgressBar::progressItem(), CProgressBar::resetItem(), and CProgressBar::slotProgressAll().